Taking a hydrogen peroxide bath is an effective way of healing the skin and detoxifying the body. Hydrogen peroxide is an all-natural sanitizer that is safe and effective when used appropriately. In addition, the warm bath water will open skin pores and enable the blood vessels below the skin to absorb the peroxide. Hydrogen peroxide is similar to ozone in that it kills microorganisms by oxidation. When the hydrogen peroxide reacts with organic material, it breaks down into oxygen and water. The type of hydrogen peroxide used for bathing is 35% food grade hydrogen peroxide. Most drug stores or health food stores will only carry the dilute 3% hydrogen peroxide. Thus, you may need to order the stronger food grade hydrogen peroxide online. Note: You could also use the more dilute 3% hydrogen peroxide, but to get the same benefits you would have to use 10 times the amount of peroxide, which would increase the cost per bath significantly. The general recommendation is to use 1 to 2 cups of 35% food grade peroxide in a bath. Most people start with 1 cup of peroxide in the bath water and work up to 2 cups after one or two times. 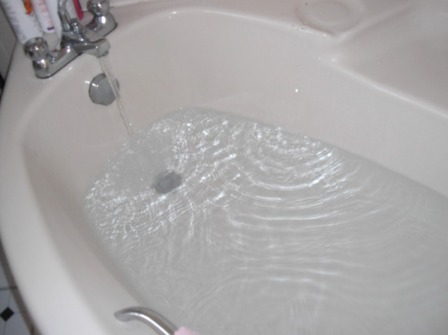 Depending on your health condition, you can soak in a warm 35% hydrogen peroxide bath for 20 to 45 minutes max. Again, I believe it is wise to start with 20 to 30 minutes, and then increase the time when you see how your body responds. When your bath is finished, step out of the bath and dry off. Do not rinse first. There are many reasons why people take hydrogen peroxide baths. Some doctors and health practitioners recommend food grade hydrogen peroxide baths for various skin ailments. The peroxide is highly effective for both disinfecting and healing skin. In addition, the peroxide baths are used for other types of infections of the lower half of the body, including yeast infections and even STDs. Many people don’t realize that our bodies produce hydrogen peroxide via certain white blood cells. Our immune system selectively uses its own hydrogen peroxide to help fight off foreign invaders, including bacteria, viruses, and various toxins. Thus, absorbing hydrogen peroxide through the skin via the warm bath is believed to be an immune system booster and is often recommended as an adjunct to other healing therapies. Food grade hydrogen peroxide (35%) can burn your skin and it will also bleach or burn through fabric quickly. Thus, be careful when pouring it into the bath and replace the cap tightly right away. Also use a glass measuring cup since the peroxide can corrode plastic. If you experience any redness, itching or burning sensation when you get in the bath, you can add more warm water to dilute the peroxide. If any of these effects persist or worsen after your bath, contact your doctor or pharmacist. As always when taking a healing or detoxifying bath, get up out of the bath slowly and hold onto something since you could experience dizziness. In general, we do not recommend taking more than one or two peroxide baths per week.